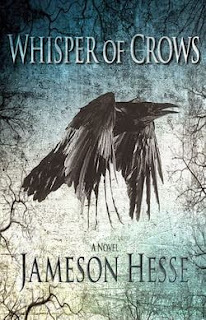 Today we're interviewing Jameson Hesse as part of the Whisper of Crows blog tour. Whisper of Crows is a supernatural thriller/horror novel. Describe the plot of Whisper of Crows in a few sentences. Kanaan James is a disturbed teenage boy obsessed with his childhood friend Abigail Caulfield. A horrible car accident leaves Abigail stricken with amnesia and Kanaan, desperate for her attention, convinces her they are soul mates on the run from the law. In the midst of a passionate love affair, while hiding in an old abandoned house in the woods, Kanaan is forced to test boundaries of his own humanity. What inspired you to write a book that explores the nature of reality? I would have to say my own spiritual explorations. Can you share with us what your creative process was like for Whisper of Crows, from the initial idea to the finished manuscript? It just started coming out and didn’t stop until it was finished. It almost felt involuntary at times. It was great therapy for me. How do you hope readers will react to Whisper of Crows? I hope the are touched deeply by the twisted love story. I hope their skin crawls with the nasty. I hope they have trouble sleeping when they are done. I hope they never forget Kanaan James, and me of course. Do you think your background in film has impacted how you tell stories when writing? I think just the opposite. I am a writer first, then a filmmaker. Writing is God. Film is just a visual echo of that. I’m writing a sequel to Whispers and another novel called Even Darker.